My first book, Racial Situations: Class Predicaments of Whiteness in Detroit (Princeton, 1999), is an ethnography of whites in Detroit, primarily focusing on poor whites from Appalachia living in the inner city. Hartigan found that the way whites think about race is keenly tied to their class identity and their location within in the city. My subsequent book, Odd Tribes: Toward a Cultural Analysis of White People (Duke, 2005), is a study of “white trash,” tracing the cultural history of this charged epithet and examining the ways some whites today identify with this term while others still use it as a degrading insult. I next developed a textbook, how-to manual on the ethnography of race. Race in the 21st Century (Oxford, 2010) surveys the efforts of sociologists and anthropologists to study racial dynamics in everyday life. Hartigan describes the emerging view in such research that see race as a performed identity. I also pursued an "ethnography of media" approach in What Can You Say? 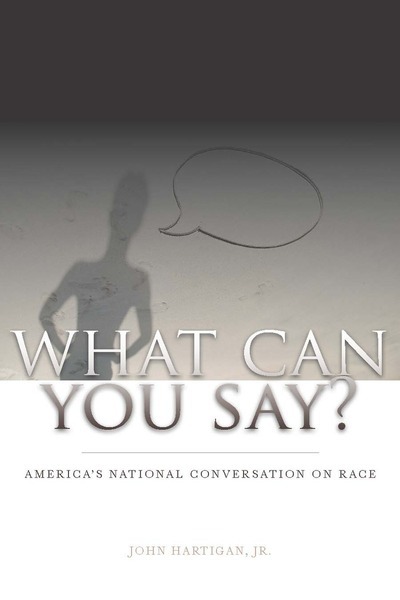 America's National Conversation on Race (Stanford, 2010). This book takes a year’s worth of race stories in the news (from MLK Day 2007 to the subsequent one in 2008) to analyze the active ways Americans make sense of race. I edited Anthropology of Race: Genes, Biology, Culture, the product of a seminar at the School of Advanced Research, in Santa Fe, New Mexico. This book confronts the challenge of formulating an effective rejoinder to new claims and data about race and genetics, articulating new conceptualization of race as a biosocial fact. I marked my turn to multispecies ethnography with an e-book, Aesop's Anthropology: A Multispecies Approach, a guide for thinking through the perplexing predicaments and encounters that arise as the line between human and nonhuman shifts in modern life. Recognizing that culture is not unique to humans, I ask what we can learn about culture from other species. I pursue a variety of philosophical and scientific ideas about what it means to be social using cultural dynamics to rethink what we assume makes humans special and different from other forms of life. Through an interlinked series of brief essays, I explore how we can think differently about being human. This class examines the many technological mediums that saturate daily life, asking how they shape our selves and our interactions with others. We begin by dissecting attention—what do we focus on, for how long, and with what affects? Attention is more than a personal matter; it has many collective forms, as well as biological dimensions. We’ll think about how we value some forms of attention and deride others, depending on social contexts and cultural sensibilities. Then we’ll sift through the layers of technological mediation that alternately facilitate, channel, or diffract our abilities to attend to relationships, objects, and the world around us. With these patterns and tendencies established, we’ll turn to analyze how media systems and technological infrastructures intentionally organize and mine collective forms of attention—online, certainly, but increasingly in real-world settings. We will sample various ethnographic techniques and methods—digital and traditional—then try these out in developing brief analytical accounts of the cultures of technologies that permeate social worlds today. We’ll conclude with some reflections on how the human and the social are being actively redefined today. The aim of this class is to encourage new forms of intellectual engagement; no technological expertise is required. This course guides students in recognizing how ecological concerns are articulated and perceived in different cultural contexts. Environmentalists in the U.S. and Europe often face challenges both in convincing peoples around the world to participate in conservation projects and in recognizing local, situated (particularly indigenous) forms of caring about ecological health and social equity. Notions of “nature” are fundamentally culture-bound, entangled with concepts of personhood and agency, power and risk, and cosmological orderings of humans and nonhumans. Beginning with an explanation of culture and its dynamics, this course will survey ecological activities in a range of settings (China, Indonesia, Brazil, and Europe), providing students a comparative framework for recognizing the criteria mobilized as people assess whether or how their environments are in peril. The analytical foundation is anthropological, emphasizing biocultural perspectives and recent work in cultural ecology, but the course will encourage interdisciplinary formulations of student research projects. Some of our case-studies will draw from science and technology studies, and students will be assisted in developing proposals that tap and mobilize various forms of expertise and knowledge claims. We will also spend time considering disciplinary debates over the Anthropocene (how to understand its dimensions and consequences) and sampling the exciting new development of “multispecies ethnography” (projects that analyze nonhumans’ roles in social and political formations). ethnographers combine theories, methods, and reflection into innovative analytical insights. The city is one of humanity’s most profound and unwieldy inventions. This course surveys the culture of cities, exploring their historical development and their current dynamism. Our perspective will encompass the great global cities as well as major urban areas in the United States. We will frame the urban experience from a number of perspectives, examining the distinctive forms of expressive culture, ethnic and racial conflict, and political or economic activity that cities generate. Students will gain an understanding of the profound impact of new technologies, immigration, and gentrification on how cities grow and decline. We will consider each of these dimensions of urban experience from a cultural perspective, which focuses on how people create meaningful lives. Objectives: Why are race and ethnicity such important aspects of our everyday lives? This course examines how and why these forms of identity matter so intensely, both in this country and around the world. Our aim is to understand the fundamental dynamics shaping racial and ethnic identity by drawing on theories and methods from anthropology. The first third of the course will cover key concepts and the basic forces that make ethnicity and race important. The second portion of the course will develop a cultural perspective on these topics by surveying a range of ethnographic work on these forms of identity. The final third of class will address a variety of ways that race and ethnicity operate in the sphere of public culture. Rather than attempt to present a survey of various groups and traditions, the aim of this course is to introduce students to the challenges of producing reliable knowledge claims about race and ethnicity. Dynamics: The lectures and readings will present various aspects of ethnic and racial identity, using examples drawn from around the globe and our everyday lives. Discussion sections on Thursdays and Fridays provide students the opportunity to comment on and raise questions about the material. Overview: This course takes a two-pronged approach, introducing students to the cultural complexity of Europe via an understanding of a premier method for generating social science knowledge—ethnography. We begin by developing a geographical and historical orientation to Europe: how has this landmass been peopled and occupied; what are its boundaries, conceptually and politically; what are the historical processes that produced its current configurations? This initial stage of the course will also introduce students to the core components of cultural analysis, developing a set of key terms that will be deployed throughout the semester to objectify social dynamics across Europe today. A basic objective is for the students to comprehend the different scales at which identity is constituted—locally, regionally, nationally, transnationally—and then distinctly inflected by the social diacritics of race, class, and gender. The remainder of the course will survey a broad range of topics—religion, migration, environmentalism, etc.—that are in the news today, principally drawing from recent ethnographic research. Students will learn how to read ethnographic and anthropological research, and then, in their final projects, formulate either 1) a prospective ethnographic research project or 2) a policy statement based principally on qualitative research. Topics Covered: We will begin with processes and conflicts over migration. The aim is to expand their focus from issues over who travels, who is welcomed or denied entry, to focus on broad questions of belonging and difference, inclusion and exclusion, seen through historical and contemporary frames. This leads into discussions of the State, particularly concerning unsettled matters of ethnicity, but then also to the subject of European integration: how it fares in certain institutional contexts (sciences, banking, etc) and where it breaks down along national or perhaps ethnic lines. We will turn next to discussion of religion and secularism, examining the alternating implicit and explicit contests over belonging that play out in debates over citizenship. Then we address the politics of environmentalism, specifically as it presents “biomes” or “ecozones” as a form of common interests and action that crosscut national boundaries in ways both similar and distinct from religion. From these fairly abstract registers, our focus will shift to topics such as sports, food, and music, taking up a range of more quotidian activities and concerns, where many of these larger topics are realized in everyday life. Class dynamics: Lectures will systematically characterize the role of fundamental cultural dynamics informing a range of current debates in Europe today. In introducing “European ethnography,” I will convey to students how the range of topics and concerns on the continent relate to broader strands of anthropological analysis and cultural inquiry. Similarly, I will take opportunities to address parallels between the U.S. and Europe on subjects like immigration or religion, in order to understand the distinctiveness of these dynamics in Europe. “Whiteness” will be one of those overarching subjects that will allow us to think through commonalities and disjunctures in how racial identities operate. Assignments will require two types of writing: 1) short-format pieces, such as policy memos summarizing multiple ethnographic sources, and book reviews that analyze ethnographies as a whole; 2) a length final project, formulating either a proposal to pursue a hypothetical ethnographic project or a policy paper on current conflicts in Europe drawn principally from ethnographic materials. Ethnography is a powerful method for analyzing cultural dynamics, objects, and settings. As a method that crosses disciplinary boundaries and is increasingly deployed by marketers, ethnography is continually being reinvented and applied in novel situations. This course combines a grounding in how to do ethnography with a survey of interesting ethnographic research today. The initial focus of the seminar will be understanding the components of fieldwork, both applying and appraising its distinctive elements (participant observation, interviewing, etc.). We will do so through reading a range of articles and book-length works. As we build familiarity with the components of ethnography, we will consider the range of subjects to which it can be applied, with a particular attention to online/social network forums and multisited projects. This will involve thinking about a variety of theoretical questions by imagining and framing them in field settings. This seminar will feature a multidisciplinary perspective, sampling how this distinctive mode of generating social knowledge operates in different institutional settings, as well as glimpsing the future of fieldwork via a variety of current innovative approaches. Our first concern will be to establish our respective interests and levels of familiarity with ethnography. Our first session we will articulate some basic objectives and guidelines for these readings and our subsequent discussions. We will also establish some touchstones for reading and critically assessing ethnographies. Then we will proceed through these books, which are loosely clumped together thematically. You are not expected to have any familiarity with these areas of research—just a basic level of curiosity and increasingly honed sensibility for what makes a good ethnography. By the conclusion of this seminar, you should have both a clear understanding of developing trends in ethnographic research and a solid grasp on the way ethnographers combine theories, methods, and reflection into innovative analytical insights. challenges of producing reliable knowledge claims about race and ethnicity. Why are race and ethnicity such important aspects of our everyday lives? Objectives for this seminar are: 1) to grapple with constituting technology as an object of inquiry; 2) to consider the breadth and variety of forms of cultural analysis today; 3) to contend with the manifold digital transformations of scholarship, particularly in the humanities. Taken in concert, these involve comprehending the changing ways we read, write, think, and teach in various digital media and formats. The complexity of this challenge becomes quickly apparent in considering the act of writing—the fundamental task of academics, but one that is steeped in metaphysical quandaries and debates. In writing, technology is both obvious and mysterious, essential to our functioning yet something that we consistently posit as a powerful external force or series of constraints. Indeed, upon close inspection, technology is so deeply entangled with everything that matters to contemporary humans—from consciousness to sociality—we have to recognize that its definition and coherence as a subject of inquiry entails a variety of interesting predicates. Understanding the way technology moves in and out of view within the broad dynamism of culture will be the focus of this seminar. Fundamentally we will concern ourselves with objects and their particular status in technical fields and practices, asking how we develop adequate accounts of their influence upon our capacities. With this question in mind, we will examine our respective roles as scholars, educators, and citizen/subjects in digital cultures. to glimpse the future of fieldwork via a variety of current innovative approaches. Why are race and ethnicity such important aspects of our everyday lives? This course critically examines how these forms of identity matter so intensely, both in this country and around the world. We will work at comprehending the fundamental dynamics that shape the development and maintenance of racial identity by drawing on key concepts from anthropology. After a general overview of how racial relations are socially structured in the United States, we will examine some of the symbolic materials and mediums through which people express a sense of ethnic identity and belonging—music, dress, dance, and stories. This portion of the course will also focus on the performance of racial and ethnic identities in various forms of popular culture. Subsequently, we will concentrate on a variety of urban settings where ethnicity is the basis for political and social mobilization. Students will have an opportunity to develop a detailed awareness of a particular ethnic group through a research paper. Our central objective in this seminar is to critically regard the broad contours of the work of Michel Foucault. Our main procedure will be to examine sequentially Foucault’s main texts, developing detailed analyses of particular passages in order to grasp his distinctive style of theorizing. From this form of engagement, we should each emerge with a heightened ability to theorize—that is, to construct or articulate perspectives on subjects that allow abstract or inchoate dimensions to become tangible. Once we have completed the following assigned readings we can move onto additional works that critique or apply Foucault’s methods or theoretical exercises. Today cultural analysis is being applied more widely than ever before, across varied domains—expressive, corporate, scientific, and social—that require different types of expertise and knowledge to properly comprehend. In this expansion of the scope of “cultural” as an explanatory framework, a focus on form provides a free-floating type of attention across a range of milieus and mediums. The analysis of form is as ancient as Greek philosophy (e.g. rhetoric) but as current as our interests in the latest technologies. This seminar surveys the variety of ways that an overarching interest in form is fueling interdisciplinary research, particularly in projects that track disparate cultural phenomenon across complex landscapes as they manifest in dense, multi-layered arrangements, often fusing financial, aesthetic, and political interests. We will examine the trend towards melding topic areas—such as “media ecology” or using “publics” with collectives of nonhuman life forms—to devise distinct ways of comprehending emergent cultural objects and activities. Media—as it references an array of substances, instruments, or channels—and mediation (in biotechnologies, communication infrastructures, legal practices, and market expansions) will serve as a basic point of orientation for seminar readings and discussion. Other examples of emergent phenomenon will be drawn from current work in science studies, post-human and biodiversity projects, and urban ecologies, which are each held together by an overriding attention to cultural forms of expression and exchange. This seminar has two goals: first, to survey the transformative impacts of new technologies on how we socialize and organize human existence; second, to evaluate how cultural theorists are responding to these developments, asking how the task of theorizing culture and society is being fundamentally challenged or reimagined. Technological developments are rapidly reconfiguring the scope and depth of the human experience, from the rise of social networking to the expansion of media infrastructures and various techniques of surveillance. Our aim will be to map the breadth of these developments and pose a series of basic questions about the ways that what counts as human today is being altered or reconstituted. We will consider how well a series of theoretical concepts—biopower (Foucault), assemblages (Deluze and Guattari), and nonhuman agency—can be applied to analyzing these developments. Readings will range across cultural studies broadly, in order to understand the array of publics that are emerging today. The seminar may also hone an historical perspective, depending on the extent of participants’ interests in assessing this aspect of techne. Scientific research and technological innovations are developed in social contexts and respond to social interests and desires. Race fundamentally informs the social influences that influence the production of technology and the pursuit of science. This course examines the multiple intersection and linkages between race, science, and technology. We begin by reviewing the array of current anthropological and sociological studies of science, which regard science as an institutionalized set of cultural practices charged with generating objective knowledge of the world. But in addition to generating knowledge, the practice of science often has drastic effect on social life. In this regard, we then turn to surveying the lkong history of “scientific racism” experiments conducted to validate the racist notions held by Europeans and Americans regarding peoples of color. In particular, we will consider how “data” was constructed in these various experiments. The second half of the course will survey the numerous ways that scientific endeavors and creations are reconfiguring racial formations in the US and around the globe. These include: environmental racism, genetic “harvesting and collecting” (of humans and seeds) and intelligence testing. “Public culture” developed over the last 20 years as an interdisciplinary means to analyze a series of spatial and social transformations stemming from the Enlightenment that profoundly contour our daily lives. From the rise of coffee houses to reconfigurations of urban space (e.g. plazas and boulevards) and the open display and circulation of scientific experiments, the public sphere sprung from an array of sources, each, in turn, shaped by dynamics of inclusion and exclusion. While these developments can be linked to the rise of the nation state, the spread of capitalism, and colonization, the distinctive mode of attention with “public culture” is towards the elusive, ephemeral, and highly local realms of everyday life. This seminar provides a survey of attempts to theorize about and analyze popular forms of sociality. Then we turn to ask how well “public culture” fares today in assessing a host of newly emergent cultural forms associated with music, advertizing, biosocial political activity, and the rapid expansion of social networking. This will involve a tangle of interesting questions related to agency (particularly nonhuman varieties) and technologies that both reflect and transform basic cultural dynamics. The Borderlands of Culture: Américo Paredes and the Transnational Imaginary, Ramón Saldivar. Signal and Noise: Media, Infrastructure and Urban Culture in Nigeria, Brian Larkin. The Ethical Soundscape: Cassette Sermons and Islamic Counterpublics, Charles Hirschkind. Insect Media: An Archeology of Animals and Technology, Jussi Parikka. This course explores human cultural diversity and the relation of culture to human experience. Cultural anthropology takes the position that, if we wish to understand the human condition, we must study the full range of human societies, past and present, and not just our own. This introductory course will sample a broad range of cultures, ranging from hunter/gatherers, small scale tribal and village societies, to the emerging post-industrial cyberculture of tomorrow. What do these cultures have in common, what makes each unique, and what is it like to live within them? Our comparative approach will examine political and economic systems, religion, language, family and kinship, law, the arts, and other institutions to better understand ourselves and all of humankind. Emily Lynch, Office Hours: 10-11 on Mondays and by appointment in EPS 4.110. Gwen Ferreti, Office Hours:, 12:30-1:30 on Thursdays at the Medicci Cafe (on Guadalupe) and by appointment. Objectives: Why are race and ethnicity such important aspects of our everyday lives? This course critically examines how and why these forms of identity matter so intensely, both in this country and around the world. Our aim is to understand the fundamental dynamics shaping racial and ethnic identity by drawing on theories and methods from anthropology. The first third of the course will cover key concepts and the basic forces that make ethnicity and race important. The second portion of the course will develop a cultural perspective on these topics by surveying a range of ethnographic work on these forms of identity. The final third of class will address a variety of ways that race and ethnicity operate in the sphere of public culture. Rather than attempt to present a survey of various groups and traditions, the aim of this course is to introduce students to the challenges of producing social knowledge about race and ethnicity. Dynamics: The lectures and readings will present various aspects of ethnic and racial identity, using examples drawn from around the globe and our everyday lives. Discussion sections on Fridays provide students the opportunity to comment on and raise questions about the material. Grading and Course Requirements: Evaluations in this course will be based on one exam and two assignments (a book review and a mini-ethnography), as well as class participation. The exam will cover roughly the first half of the course and represent 30% of your grade. The book review, of Blue-Chip Black, will count for 20% and the ethnographic project, regarding some aspect of race and ethnicity, will be worth 40% of your overall grade. Both these assignments are described below. Class participation (i.e. active involvement in discussions, attendance, etc.) will count for 10% of the final grade. Attendance Policy: Attendance for lectures is expected and is mandatory for discussion sections. Students with two or more unexcused absences from discussions will have their final evaluation reduced by at least one letter grade. This syllabus is not a contract; reading assignments and topics are subject to change, reflecting the general pace of student/instructor progress in this class. Texts: (available at University Co-op and Beat the Bookstore). Ethnicity and Race: Making Identities in a Changing World, Cornell & Hartman. Blue-Chip Black: Race, Class, and Status in the New Black Middle Class, Lacy. A reader will be available at Abel's Copies, 715-D W.23rd Street. Phone: 472-5353. W 8-26: Why race and ethnicity matter. Week 2 Colonialism, Nationalism, Post-colonialism. M 8-31: Historical overview. Readings: Ethnicity & Race, Chps 1-2. W 9-2: The Balkans and the Caucus Mts. Readings: Ethnicity & Race, pgs 146-153. Week 3 Ethnicity: The Middle East and Africa. M 9-7: No class for Labor Day. W 9-9: Postcolonial Ethnicity. Readings: Ethnicity & Race, Chps 3-4. Week 4 Race, Culture, Power. M 9-14: What is Race? Readings: Ethnicity & Race, Chp 5. Week 5 Landscape of Race: Politics, Labor, Residence. M 9-21: Possessive Investment in whiteness. Readings: Lipsitz. W 9-23: Pulling it all together. Readings: Ethnicity & Race, Chp 7-8. Week 6 America's "National Conversation on Race." M 9-28: 2007: A year of race in the news: "arenas" and "interpretive repertoires." Readings: Hartigan, "From 'gangsta parties' to the 'post-racial' Promised Land: A year of race stories"
W 9-30: 2009: updating the conversation. Readings: Hartigan, "'Race Doesn't Matter': Manic glimpses of a post-racial future." Week 7 Cultural Perspectives on Race. W 10-7: Ethnography and Cultural analysis. Readings: Restaurants Book (selected chps.) and Blue-Chip Black, Preface and Appendix A. Week 8 Whiteness: Ethnographic Perspectives. M 10-12: Studying white people, pt 1. Readings: Hartigan, "White Detroit." W 10-14: Studying white people, pt 2. Readings: Hartigan, selection from Race in the 21st Century. Week 9 Blackness: Ethnographic Perspectives. M 10-19: Studying black people, pt 1. Readings: Kelley, "Yo' Mama's DisFUNKtional." W 10-21: Studying black people, pt 2 . Readings: Jackson, "Real Fiction." Week 10 Beyond Black and White: Ethnographic Perspectives. M 10-26: Latino ethnographies. Readings: Limon, "Carne, Carnales, and the Carnivalesque." W 10-28: Asian and diasporic identities, Readings: Parrenas and Siu, "Asian diasporas." M 11-2: Blue-Chip Black, Introduction + chps 1-3. W 11-4: Blue-Chip Black, chps 4-6 + Conclusion. M 11-9: Cultural Analysis. Readings: Hartigan, "Taking it to the field." W 11-11: Racial Analysis: The case of "white music." Readings: Perry, "Doing Identity," Frere-Jones, "Paler Shade." W 11-18: Multicultural Corona and Black Corona. Readings: Black Corona, Gregory. M 11-23: Debates over belonging. Readings: Oboler, "Racializing Latinos in the U.S.: Toward a New Research Paradigm." M 11-30: Readings: Nakamura, "Digital Racial Formations." Assignments: Here are initial, basic descriptions of the written projects you will do in this class. More detailed information will be provided when we reach the portion of the course that features these assignments. These projects are designed to facilitate your engagement in the process of generating social data and analysis concerning race and ethnicity. The goal in this writing project is to develop your understanding of what make a good ethnography. In reviewing Blue-Chip Black, your aim is to summarize the core methods, theories, and research questions developed and deployed by Karyn Lacy. You will need to provide an overview of the book's key concerns and findings. But you will also need to hone in on aspects of this ethnography that you find particularly interesting. In closing this review, you must convey an overall assessment of the work, reflecting on its strengths and weaknesses. Identifying assumptions about and orientation towards race. Formulating a cultural question or frame of analysis. Practicing techniques of observation and interviewing. Identifying relevant units of analysis. General Grading Criteria for Papers. Scholarly writing is both an exercise in thinking and an expression of intellectual engagement with a topic or issue. Through writing you discover your relationship to a subject-not simply what you think and feel about it, but your investment or disinterest in this matter. I use the following evaluative registers for assessing the quality of a paper. While they overlap and interrelate, these foci are a means of specifying the elements of a paper. A. Contextualize: How well has the subject been introduced? Is the context both clear and developed? Can I immediately recognize the issues that both have generated the discussion and that the paper will address? Are conclusions drawn in clear correspondence with the body of the paper? B. Summarize: Is the topic well-thought out and clearly expressed? Are the scope and character of the issue cogently rendered? What is the tenor of the discussion and what form of evidence or data is being deployed? C. Elaboration: How is the argument shaped and embellished? Is it effectively supported through a range of sources? Are examples well marshaled; do they enhance or disorient the discussion? Does the paper evidence developed thinking about the subject? Under this section, I often ask myself whether I have learned something. D. Writing: Is it good? Remember: emphasis, unity, and coherence make a sentence effective and make its meaning clear; for paragraphs, be sure they correspond to the development of a complete thought, with all its qualifiers and correctives set forth in full. Rhythm and internal strength are fundamental for each of these critical elements of composition. E. Thoroughness: Is the work complete? Obviously, this answer is relative to the stated length requirements, but the question always keys upon whether a subject is adequately (and energetically) developed. Are ideas given multiple inflections? Is there complexity to the thought process? Am I offered competing views that resolve in a final, clear position or, perhaps, remain suspended in an engaged uncertainty? I rely on these last registers to assess the overall capacity of a paper. 1. Strength of argument or exposition; is there sophistication to the way connections have been drawn, detailed, and commented upon? 2. Relevance to the course or assigned subject. 3. Innovation in choice of topic or mode of argument. Please check back with updates. Aesop’s Anthropology is a guide for thinking through the perplexing predicaments and encounters that arise as the line between human and nonhuman shifts in modern life. Recognizing that culture is not unique to humans, John Hartigan Jr. asks what we can learn about culture from other species. He pursues a variety of philosophical and scientific ideas about what it means to be social using cultural dynamics to rethink what we assume makes humans special and different from other forms of life. Through an interlinked series of brief essays, Hartigan explores how we can think differently about being human. We are in a transitional moment in our national conversation on race. Despite optimistic predictions that Barack Obama's election would signal the end of race as an issue in America, the race-related news stories just keep coming. Race remains a political and polarizing issue, and the sprawling, unwieldy, and often maddening means we have developed to discuss and evaluate what counts as "racial" can be frustrating. In What Can You Say?, John Hartigan Jr. examines a watershed year of news stories, taking these events as a way to understand American culture and challenge our existing notions of what is racial—or not. The book follows race stories that have made news headlines—including Don Imus's remarks about the Rutgers women's basketball team, protests in Jena, Louisiana, and Barack Obama's presidential campaign—to trace the shifting contours of mainstream U.S. public discussions of race as they incorporate new voices, words, and images. Focused on the underlying dynamics of American culture that shape this conversation, this book aims to make us more fluent in assessing the stories we consume about race. Advancing our conversation on race hinges on recognizing and challenging the cultural conventions governing the ways we speak about and recognize race. In drawing attention to this curious cultural artifact, our national conversation on race, Hartigan ultimately offers a way to to understand race in the totality of American culture, as a constantly evolving debate. As this book demonstrates, the conversation is far from over. What is the state of race relations in the U.S.? Are we making progress toward ending racial discrimination and prejudice? What, exactly, does "race" mean? In Race in the 21st Century: Ethnographic Approaches, John Hartigan takes an anthropological look at questions such as these by introducing students to the study of race through qualitative approaches. In the first text to take an explicitly ethnographic approach, Hartigan summarizes and explains the current state of social science knowledge on race in the United States. In the process of surveying this research, Hartigan guides readers to think through basic important questions about race in relation to their own circumstances. Unlike many texts, however, this one focuses not on essential differences between racial or ethnic groups, but rather on the commonalities. The author concentrates on the particular contexts where people actively engage and respond to racial meanings and identities. In this way, he encourages readers to think critically about the meaning of race. Ideal for undergraduate courses in race and ethnicity, the anthropology of race, and cultural/human diversity, Race in the 21st Century seamlessly brings together classic and contemporary studies in one accessible volume. 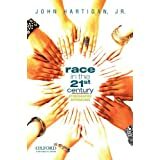 The author is also hosting a companion website http://www.raceinthe21stcentury.com/ that features useful web links, sample assignments, and reviews of ethnographies not covered in the text. A brief and accessible look at the current state of social science knowledge on race in the U.S. Introduces students to the study of race through ethnographic approaches. Key concepts include cultural processes such as racial formation, racialization, and colorblind racism; the tools to perform cultural analysis in order to understand cultural dynamics; and the controversies surrounding racial identity as it relates to human diversity. Ethnographic vignettes include both classic and contemporary studies such as Powdermaker's After Freedom and Moffatt's Coming of Age in New Jersey. The text focuses on commonalities instead of differences between racial or ethnic groups. The author encourages readers throughout to think critically about race as it applies to their own lives. 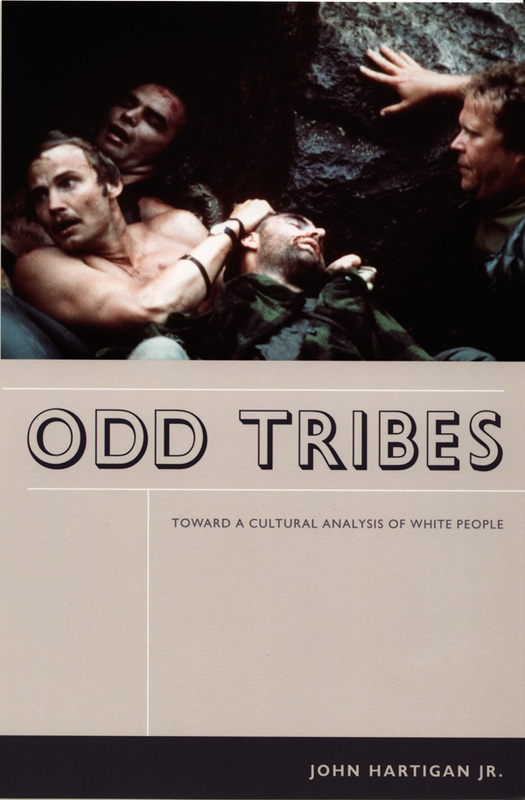 Odd Tribes challenges theories of whiteness and critical race studies by examining the tangles of privilege, debasement, power and stigma that constitute white identity. Considering the relation of phantasmatic cultural forms such as the racial stereotype “white trash” to the actual social conditions of poor whites, John Hartigan Jr. generates new insights into the ways that race, class and gender are fundamentally interconnected. By tracing the historical interplay of stereotypes, popular cultural representations, and the social sciences’ objectifications of poverty, Hartigan demonstrates how constructions of whiteness continually depend on the vigilant maintenance of class and gender decorums. Odd Tribes engages debates in history, anthropology, sociology, and cultural studies over how race matters. Hartigan tracks the spread of “white trash” from an epithet used only in the south prior to the Civil War to one invoked throughout the country by the early twentieth century. He also recounts how the cultural figure of “white trash” influenced academic and popular writings on the urban poor from the 1880s through the 1990s. Hartigan’s critical reading of the historical uses of degrading images of poor whites to ratify lines of color in this country culminates in an analysis of how contemporary performers such as Eminem and Roseanne Barr challenge stereotypical representations of “white trash” by claiming the identity as their own. Odd Tribes presents a compelling vision of what cultural studies can be when diverse research methodologies and conceptual frameworks are brought to bear on pressing social issues. Racial Situations challenges perspectives on race that rely upon oft-repeated claims that race is culturally constructed and, hence, simply false and distorting. John Hartigan asserts, instead, that we need to explain how race is experienced by people as a daily reality. His starting point is the lives of white people in Detroit. As a distinct minority, whites in this city can rarely assume they are racially unmarked and normative--privileges generally associated with whiteness. Hartigan conveys their attempts to make sense of how race matters in their lives and in Detroit generally. Rather than compiling a generic sampling of white views, Hartigan develops an ethnographic account of whites in three distinct neighborhoods--an inner city, underclass area; an adjacent, debatably gentrifying community; and a working-class neighborhood bordering one of the city's wealthy suburbs. In tracking how racial tensions develop or become defused in each of these sites, Hartigan argues that whites do not articulate their racial identity strictly in relation to a symbolic figure of black Otherness. He demonstrates, instead, that intraracial class distinctions are critical in whites' determinations of when and how race matters. In each community, the author charts a series of names--"hillbilly," "gentrifier," and "racist"--which whites use to make distinctions among themselves. He shows how these terms function in everyday discourses that reflect the racial consciousness of the communities and establish boundaries of status and privilege among whites in these areas. Translating “race” and “raza” between the United States and Mexico,” North American Dialogues, 16 (1): 32-45, 2013. Millennials for Obama and the Messy Antic Ends of Race, Anthropology Now, 2(3): 1-9, October. Is Race Still Socially Constructed? : The Controversy over race and genetics. Science as Culture, 17(2), 163-193. Race Does Matter, But Not in Ways We Expect. Austin American Statesman, September 1, 2008. What if Obama is Wrong. Austin American Statesman, March 20, 2008.
Review of An Unexpected Minority: White Kids in an Urban School. American Journal of Sociology 112(6). Saying Socially Constructed is Not Enough. Anthropology News, February 2006. Culture Against Race: Reworking the Basis for Racial Analysis. South Atlantic Quarterly, 104(3), 543-560.